The very latest UK Postcodes as well as historic postcodes, linked to a series of flat Comma Separated Variable (CSV) files that open in Excel, Access and other applications capable of importing delimited text data (we're happy to supply in other formats as needed). To complete your coverage, you may want to add the street name level or premise level PAF data. The Traditional County is the county name most recognised by the public even if the counties do not technically exist anymore – for example Middlesex. This county field is most useful for public facing website applications where users are requested to select a County for an address etc. Postcode to District: Local Authority official District Name. English Districts (metropolitan and non - metropolitan), London boroughs and unitary authorities average around 23 electoral wards/divisions each, Northern Irish districts around 22, Scottish council areas around 11 and Welsh unitary authorities about 40. Postcode to Ward: Also known as Electoral Divisions in Wales and Isle of Wight: An administrative division of a city or borough that typically elects and is represented by a councillor or councillors. Wards are found in Scotland, Northern Ireland and England. Postcode to Boroughs: A town or district which is an administrative unit, in particular. A town (as distinct from a city) with a corporation and privileges granted by a royal charter and who as a town sends representatives to Parliament. There are 32 actual boroughs, with a status similar to metropolitan districts, and also the City of London, which is a City Corporation and has a number of additional roles. Boroughs are further subdivided into electoral wards. This database is widely used in Health Service applications for matching patient or staff records to the relevant health authority information and for statistical analysis of national health information. The data contains the codes and names for the Primary Care areas in England, Local Health Boards (LHBs) in Wales, Community Health Partnerships (CHPs) in Scotland and the Local Commissioning Group (LHG) in Northern Ireland. There are no codes or names for the Channel Islands. 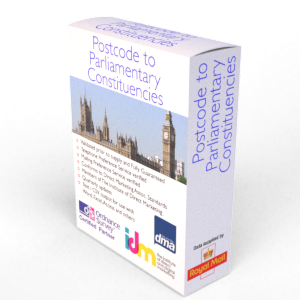 A full database of over 2.5 million UK Postcodes with their respective Parliamentary Constituencies and the MP Name and Party Name for each area. The file includes NI, Welsh, English and Scottish Constituencies / Assemblies. The definitive Postcode database which includes all Postcodes for the United Kingdom (England, Scotland, Wales and Northern Ireland) with their respective 6 figure OSGB grid references and Longitude and Latitude. Travel to work areas were produced for the purpose of conducting labour market analysis and planning and are defined as areas where the majority of resident population also work within the same area. There are over 28,000 Postcodes falling within one of the 15 National Parks of the United Kingdom. If a Postcode isn't in the database, it doesn't fall within a National Park area. The Postcode Database covers the United Kingdom. The data is supplied as a series of Comma Separated Variable (CSV) delimited text files, using double quotes by default. This field format will open very easily using almost any software application including but not limited to Excel, Word, Notepad, Access, SQL etc. Due to the size of some files, older versions of Excel (pre 2010) may not fully open the files supplied as these older versions of Excel limit any opened file size to the first 65,000 rows / records. The Postcode Database data is by default emailed at the time of order using a secure download link delivery method. If you require the data supplied in another format then we will be more than happy to accommodate you where reasonable to do so at no extra cost. The Postcode Database list is licensed annually for each user that has access to it.